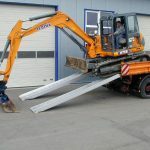 When it comes to ramps and access equipment, aluminium has many advantages over steel and other less suitable materials. Here are some of the benefits you can expect from a high-quality aluminium ramp. The utility of any metal is limited if it doesn’t have a certain resistance to corrosion. Aluminium is highly resistant against corrosive substances, making it exceptionally durable. Aluminium’s durability makes it ideal in industrial or outdoor settings where water, salt, solvents or chemical agents may come into contact with access equipment. Steel may be strong, but it’s also very heavy. Aluminium on the other hand is strong, sturdy and light. This makes life much easier when transporting and installing ramps. It’s particularly useful for temporary ramps which move frequently in and out of storage. From an aesthetic viewpoint, aluminium also outperforms. It’s a clean looking material and can be easily varnished, anodised or treated with a wide range of coverings. What’s more, because of its anti-corrosive qualities, it stays looking good for much longer. In high risk industrial settings, perhaps where there are flammable substances nearby, aluminium is a safe option as it doesn’t spark when rubbed against other metals. This also makes it an ideal choice for vehicle ramps. Aluminium recycling has been around for many years, and now most industry products come from recycled aluminium. When your ramp reaches the end of its life it can also be recycled, ensuring minimal environmental impact. Looking for superior aluminium ramps at low prices? Talk to the Rampco team today about our range, including plant and vehicle ramps, disability ramps, premises ramps and van loading ramps. Or explore the ramp range online.